I start using VMware Workstation back in 2001 and the reason was to lower the number of physical desktops i had to use at the office. Worked for a service provider and different customers required different images when joining their network for administrative purposes. I started with server virtualization about 10 years ago. · Master the technical aspect of the VMware software, Virtual Infrastructure 3 at the time I started the VCDX journey. · Putting my thoughts and decisions on paper in a structured way. · Stand in front of a couple of very skilful persons and explain what i have done and why. From the time I decided to give the VCDX certification a try it took 18 months before i completed the VCDX defence. I had already completed the VCP 3.0 so my first leg was the Enterprise-Level Systems Administration Exam, which is the VCAP-DCA these days. This was back in August 2009. Don’t rush and be prepared to put a lot a hours into this certification. In addition, take time to get experience in all the areas included in the VCDX path you’re interested in. Include as much customer facing activities as possible. Don’t think I would change much in the actual process but obviously in the design choices because other alternatives are available today. I would try to connect with other VCDX candidates, which I didn’t back in 2010, and join study groups or at least find someone to discuss my design with. Now, VMware also offers a VCDX mentor program, which I would definitely sign up for. The VCDX journey was totally worth it, no question about that. I think I’m a better architect now and during the certification I improved my skills to document, present and defend my thoughts. The VCDX certification was not that known in Sweden back in 2010 when I completed my first VCDX so it actually didn’t impact my daily job that much in terms of customer assignments. My company benefited from my VCDX certification a couple of times when a potential customer requested it. After my second VCDX (Cloud) certification there was a lot more recognition via social media e.g. 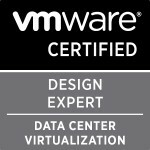 twitter and I was also interviewed by VMware Certification regarding my double VCDX. Categories: Certifications, VCAP, VCDX, VMware | Tags: Certifications, VCAP, VCDX, VCDX-Cloud, VMware | Permalink.